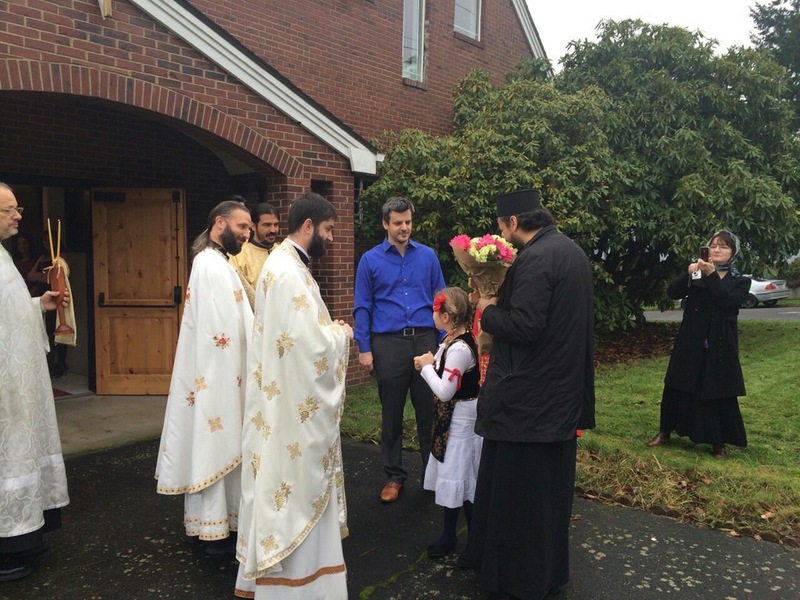 Portland, OR - On the Sunday of the Holy God-bearing Fathers, January 11, 2015 His Grace Bishop Maxim of Western America served the Holy Hierarchical Divine Liturgy at St. Stephen the First Martyr and Archdeacon, on the occsion of the celeration of their church Slava. Con celebrating with the bishop were V. Rev. Predrag Bojovic, from the Seattle parish and the Episcopal dean of the Butte Deanery, Fr. Daniel Mackay from Eugene and the host priest Fr. Milan Unkovic. Also serving were the bishop's deacon, Deacon Zoran Aleksic and Deacon Stephen Dyer from Eugene. Following the gospel reading Bishop Maxim addressed the gathered people with a pastoral homily. The Slava Litiya followed the communion of the faithful and cutting of the Slava Kolach. An agape meal and children's program was prepared in the church hall after the Divine Liturgy.